Tucked away in the second floor of the B&H Superstore is their Event Space. All year round, B&H schedules seminars, lectures and hands-on demos covering every aspect of photography and video. These events range from beginner level to pro and are conducted by practicing pros and senior industry spokesmen. For example in June, reps from Canon, Lexar, ASUS all appeared in the Event Space. Then, there are the real “events” like a photo-walk over the Brooklyn Bridge or through Central Park. B&H has also added software-specific seminars on Photoshop, Lightroom, Premiere and After Effects. Yesterday, I attended the Lighting Portrait Workshop by Westcott. Dave Piazza, the Technical Advisor for Westcott started with lighting theory and then moved to practical applications with a 3-light set-up. 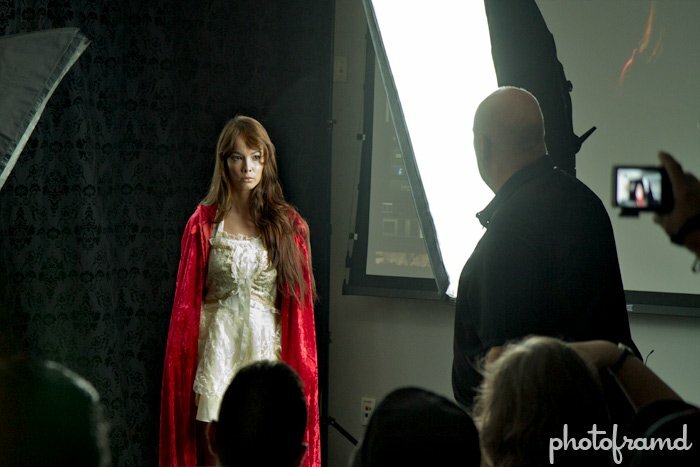 This free four-hour seminar even included time for the attendees to take pictures of the models using the Westcott products. So, the next time you are planning a trip to B&H, take a look at their Event Space. Just remember to register beforehand. Space is limited and many events close-out.